Treat yourself and your loved ones with these delicious soft and tender melt-in-your-mouth Peanut Butter and Chocolate Chip Cookies. These Peanut Butter and Chocolate Chip Cookies are just what I needed today. Soft and tender with that melt in your mouth texture, these peanut butter cookies are hard to resist. Though I’ve always enjoyed peanut butter cookies I’ve never really had serious cravings for them, well at least not until I made these. 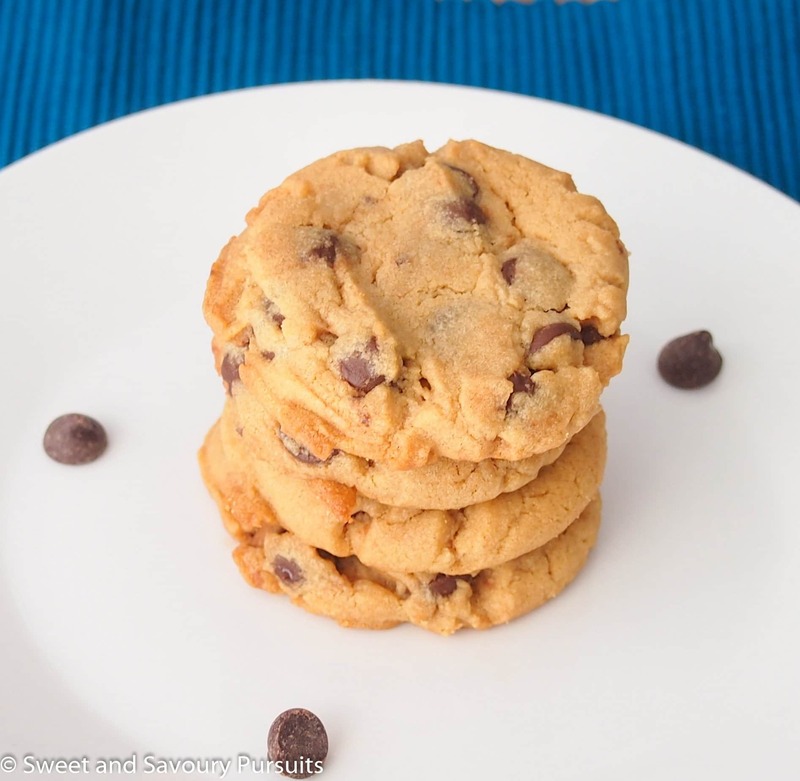 You are going to love this really quick and easy recipe for Peanut Butter and Chocolate Cookies. The cookies are soft and chewy when fresh out of the oven but start to get slightly crispier on they outside as they sit on counter. Soft and chewy is really my preference, so I always make sure to enjoy a couple while they are still warm and fresh out of the oven. You’ll want to make sure to let the cookies sit on the baking tray for 5 minutes so they can firm up, they’ll break if you try to remove them right away. If you have time on your hands and are looking for a more decadent peanut butter cookie then you will want to take a look at these Stuffed Peanut Butter Cookies. 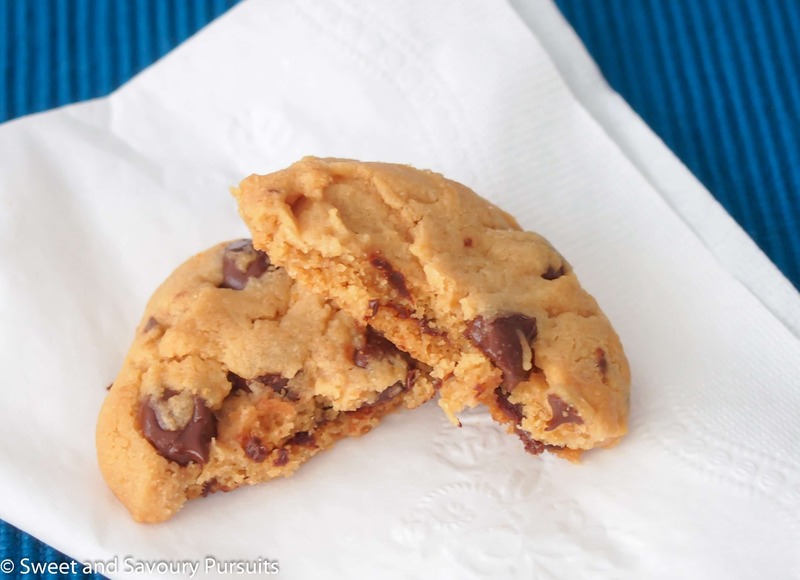 Treat yourself and your loved ones with these simple to make delicious and tender Peanut Butter and Chocolate Chip Cookies. Place a rack in the centre of your oven and preheat the oven to 350°F. Line 2 cookie sheets with non stick liner or parchment paper. In a bowl, combine the flour, baking soda and salt, set aside. In the bowl of a stand mixer, beat the butter and brown sugar until well combined. Add the peanut butter and beat until blended, add in the egg and vanilla. Beat on medium speed until light and fluffy. Reduce the mixer speed to low and add the flour mixture. Mix until the dough comes together, add the chocolate chips and beat until combined. Using a number 50 scoop, scoop the cookie dough and place the balls of cookie dough on the baking sheet. Using your fingers, press down on the cookie dough balls to flatten them a bit. Bake for 10 minutes or until tops are set and cookies are lightly golden on the bottom. Remove the cookies from the oven and let cool on the baking sheet for 5 minutes before moving them onto a rack to cool completely. The cookies can be stored at room temperature in an airtight container for up to a week. You can also freeze them. Glad you like it, hope you give the recipe a try. Peanut butter and chocolate is my all time favorite combination!